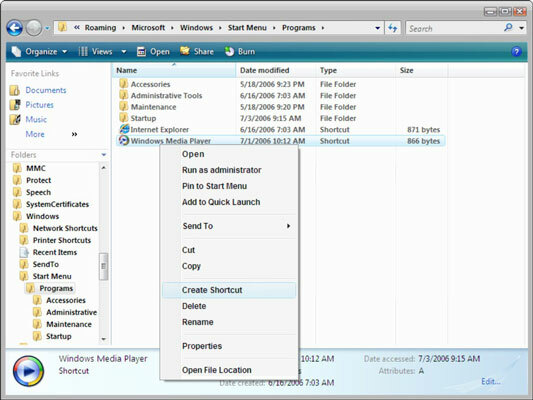 Creating a desktop shortcut to a file or folder in Windows Vista eliminates the need to work your way through Windows Explorer. In Vista, a shortcut is an icon that you can double-click that takes you right to the file or folder you want, so you don’t have to navigate deeper into other folders to get to it, which can be a great time saver. Locate the file or folder by using Windows Explorer. Right-click the file or folder that you want to create a shortcut for and choose Create Shortcut. A shortcut named Shortcut to File or Folder Name appears at the bottom of the currently open folder. If you want to be able to access your file or folder directly from the desktop, click the shortcut and drag it to the desktop. Double-click the desktop shortcut icon. A file shortcut will open in its originating application, and a folder shortcut will open in Windows Explorer.